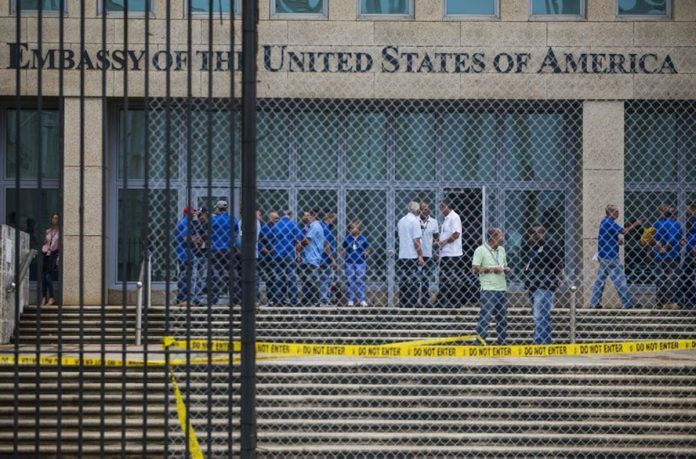 The State Department announced on Friday that it is pulling more than half of its staff out of the American embassy in Havana in the wake of mysterious attacks that have injured 21 people associated with the embassy. The United States delivered an ominous warning to Americans on Friday to stay away from Cuba and ordered home more than half the U.S. diplomatic corps, acknowledging neither the Cubans nor America’s FBI can figure out who or what is responsible for months of mysterious health ailments. The U.S. actions are sure to rattle already delicate ties between the longtime adversaries who only recently began putting their hostility behind them. The U.S. Embassy in Cuba will lose roughly 60 percent of its American staff and will stop processing visas for prospective Cuban travelers to the United States indefinitely, officials said. Roughly 50 Americans had been working at the embassy. Cuba blasted the American move as “hasty” and lamented that it was being taken without conclusive investigation results. Still, Josefina Vidal, Cuba’s top diplomat for U.S. affairs, said her government was willing to continue cooperation with Washington “to fully clarify these incidents.” Her government took the rare step of the inviting the FBI to the island after being presented with the allegations earlier this year. State Department Pulls Diplomats Out of Cuba and issued an advisory warning American citizens to stay away from Cuba after health ‘attacks’.